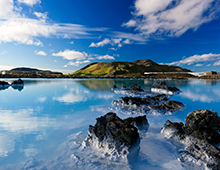 Iceland is a Nordic island nation that is defined by its dramatic landscape with volcanoes, geysers, hot springs, and lava fields. 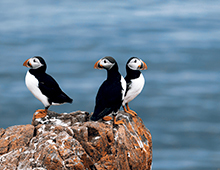 Though Reykjavik has its own draws, the area surrounding it boasts an incredible wealth of scenery and activities. Just a couple of hours outside of the city, you’ll suddenly find yourself walking on lava rocks, driving through a long, dramatic fjord and on top of a glacier, and learning how glaciers formed as you walk through an ice cave. The 20+ hours of daylight will give you time to discover Reykjavik before or after your tour as this city is teeming with life at all hours. Don’t miss this opportunity to truly understand, see, and learn about the people, the history, and geography of this magical and mystical country with the women of Olivia. Our Travel Consultants can be reached at USA or CANADA: (800) 631-6277 or INTERNATIONAL: (415) 962-5700, option 1. Reserve early as our packages are very popular and this is a popular time in our destination. Any unused space will be released early! This pre-trip does require a HIGH LEVEL of mobility, as most of the tours require extensive walking on uneven surfaces and glaciers (which are very slippery) for long distances, up and down hills and stairs, and require standing for extended periods of time. Please note that wheelchairs and scooters cannot be accommodated on this tour. If you do have limited mobility and feel that you are still able to do the activity level requirements, you are required to travel with someone who can assist you. Expect days to be very long with a lot of driving in Super Jeeps. On July 14, we will not arrive at the hotel until 6:30 pm. 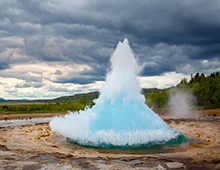 Once on tour, there is no way to get back to the hotel on your own as we will be leaving the city and going to experience the natural wonders and beauty outside of Reykjavik. While the beauty of Reykjavik is pure, raw, and strangely otherworldly, the natural wonders that lie just outside of the city can't be missed. 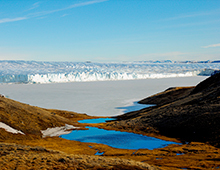 Enjoy explorations to Greenland, considered the biggest island in the world and noted for its vast tundra and immense glaciers. Sitting mostly above the Arctic Circle, two-thirds of the island, with a huge part of the island covered by a massive ice cap second only to Antarctica’s in size, Greenland is an autonomous Danish territory that sits between the North Atlantic and Arctic oceans. Long, deep fjords reach far into both east and west coasts in complex systems, offering magnificent, if desolate, scenery. Along many parts of the coast, the ice sheet fronts directly on the sea, with large chunks breaking off the glaciers and sliding into the water as icebergs. Greenland is really all about the adventure and will take your thirst for adventure to the next level. 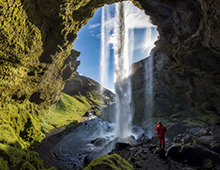 DEADLINE TO BOOK ONE-NIGHT ICELAND POST-PACKAGE IS MARCH 29, 2019 OR UNTIL SOLD OUT! 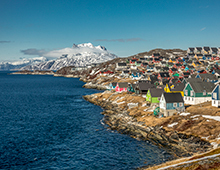 DUE TO GREENLAND AIRLINE'S DEADLINES, NAME CHANGES AFTER MARCH 29, 2019 MAY REQUIRE THE PURCHASE OF A NEW TICKET. This post-vacation does require a high level of mobility, as most of the tours require extensive walking on uneven surfaces and glaciers (which are very slippery) for long distances, up and down hills and stairs, and require standing for extended periods of time. Please note that wheelchairs and scooters cannot be accommodated on this tour. If you do have limited mobility and feel that you are still able to do the activity level requirements, you are required to travel with someone who can assist you. Once on tour, there it will be very difficult to get back to the hotel on your own as we will be leaving the city and going to experience the natural wonders and beauty outside of Reykjavik while in Iceland and while in Greenland, during some tours, there will be no way to get back to the hotel. All Vacation Stretcher packages are non-refundable. A handling fee of $75 will be charged for any name changes to hotel and tour package. Your booking/payment for vacation stretchers with Olivia Companies, LLC indicates your compliance with the above policies.